I asked because I have always believed that the choice of lettering style should help to help and support the intent of the message. 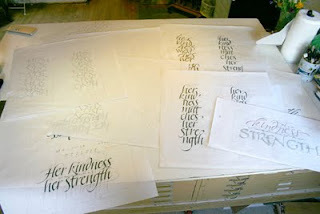 Something I have tried to apply (not always successful), is the comment on Neugebauer's "mode of operation"...."He analyzed the texts he was to write, got as near as possible to the intention of the author and then made it visible on paper" Diane Hoare says, "calligraphy should help us see what we are reading by making the words beautiful" Sometimes while italic is a good standard that will serve us well in most cases it does not always achieve the above. 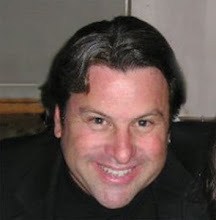 When I lived near Doug we would frequently get together and talk about the "theory" of what each of us were doing. I thought this might be a good springboard for a discussion of the development of a piece of lettering art and the design decision process. My wife came to me with a quote she wanted to do for a friend. 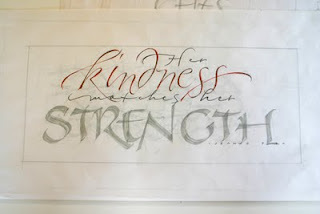 Because she knows the friend well, and has a particular piece of calligraphy that she wanted it to sorta look like, I was forced to work with the "commissioner's" demands. 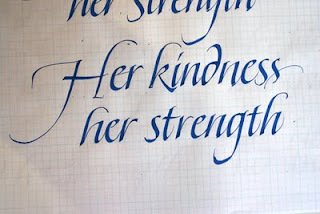 What she really wanted was a simple piece, done in an italic style hand, and with a bit of an illustration to make it "simple and pretty". 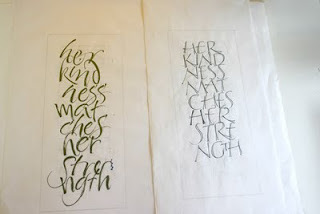 Of course, I as the calligrapher know MUCH better than she how to go about the process... don't I?! When I initially received this quote, I immediately sat down to do some rough drafts, detailed in the images below. 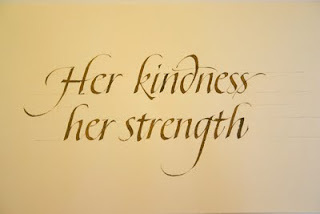 Here the words "kindness" and "strength" are articulated more along the lines of the Friedrich Neugebauer quote... I am trying to articulate visually the feeling of those two words. 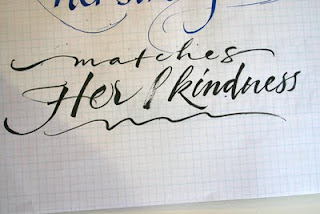 There are a couple of problems with the above layout; one is that the quote says that the kindness "matches" the strength, and in the above layout the two words certainly don't "match". 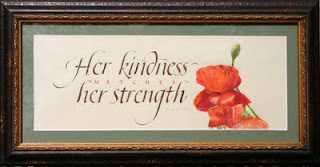 Second is that the woman that this piece is intended for usually has her "strength" emphasized before her kindness and we wanted to de-emphasize that. Of course the "commissioner" (who had a simple and pretty layout in mind to begin with) wasn't going for those. So... going back to my earlier version, I decided just to clean up the lines a bit, unify the lettering and go with the commissioner's wishes. 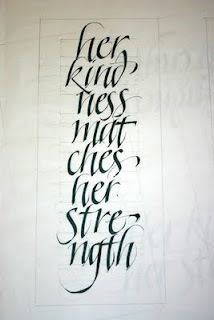 The above was done with walnut ink on Zerkal's paper, called here in the U.S. "Niddigan". Great post! Thank you for sharing your process. Beautiful piece. This is very helpful post for layout..which is rarely discussed. Do share some more of it. 2016...I appreciate your sharing...layout works my brain... doing Psalm 16:8...whew!! -- Journal Series: What is it that transforms you? -- Newly Completed painting: "Holly in the Red Gloves"
-- The announcement of the new C.S. Lewis College, and a story. 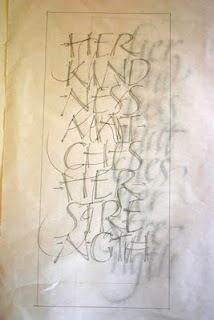 -- When calligraphy goes wrong... analyzing your own work and going back to the basics.